Emperor Norton's Stationary Marching Band calls its production "Mischief in the Machine" a "circus folktale." Indeed, a selection of nifty little circus acts, like aerialists, contortionists, and German wheel, enliven this entertaining show, which played to sold-out houses at Boston University Dance Theater over the weekend. Unfortunately, it takes awhile to get to the good stuff in this theatrical hybrid, which like Cirque du Soleil combines drama, dance, mime, and live music. The "tale" follows a society of Drudges, cogs in the machinery of a world run by a heartless Autocrat (performance artist Mallory Hanora) for whom beauty and art are useless and depraved. Only efficiency and work have value. Z (the sprightly Ruckus Muckus) refuses to succumb to the deadening tyranny and becomes the "mischief in the machine" that throws everything off kilter, provoking the minions to toss their grim, gray masks to dance and sing. Created by impresario/artistic director Chuck Lechien Jr. and directed by Johnny Blazes, the show puts forth an intriguing idea, but the dramatic context is a little belabored given that many of the performers don't quite have the dramatic chops to pull it off. There is a lot of unconvincing mugging and miming that reads as amateurish. It gets tedious after a while and gives the production a rather loose, homespun quality. And clocking in at two hours, it's too long for the amount of substantive material. It would have benefited from some judicious editing and tightening, not to mention a little more imagination in the movement department. The dance element is rudimentary at best. But Saturday night's enthusiastic audience didn't seem to mind, especially once Z led a small cadre of rebels into an enchanted world full of spectacle, color, and light. This is when "Mischief in the Machine" takes a more playful tone as it showcases its brightest circus talents. Joanna Keseberg cracked the whip over the super-limber contortionists Tracy McAskill and Morgan Oldham, who cavorted like two oversexed exotic cats. With spidery limbs and rubbery backs, they balanced in eye-popping poses so convoluted they were almost painful to watch. Owen Hope spun end over end on the German wheel, a double hoop contraption with grips for hands and feet, and Liz Manicatide and Phil Servita performed on aerial tissu, two swaths of crimson fabric dangling from the ceiling. Their sensuous couplings sent them up and down, over and under each other in striking, intricately twined shapes. Rachel "Dozer" Darman and Clara LaFrance also excelled in brief solo turns on the tissu as well as on the lyra, a suspended aerial ring. The most impressive act was B.J. 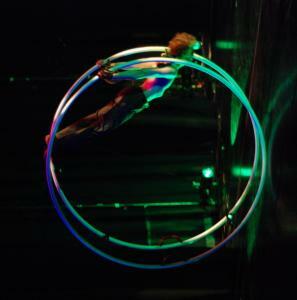 Erdmann's performance on aerial straps. Spinning, spiraling, and flipping, he worked his way from floor to ceiling and back again in vivid asymmetrical poses as the straps wrapped around his limbs and body with each twist. All the activity is driven by the lively 11-piece Emperor Norton's Stationary Marching Band. The original score is mostly by music director Lechien and features the band's characteristic sax-heavy nouveau klezmer. It's like a lively, slightly raucous blend of Eastern European vagabond music mixed with trash percussion and avant-garde dissonance that effectively sets the tone of the show and keeps it rocking.